This week flashed by in the blink of an eye. I am so looking forward to my weekend at home! I am linking up with Tif, Becky, Katie, and Della for High Five For Friday. 1.) We spent the weekend with Hubby's family. Hubby went to the Labour Day football game with his good friend. I enjoyed the company of Hubby's, brothers, Auntie and Oma. We had such a wonderful time visiting with family. Hubby's family also taught Miss. E to cheer on his team with great enthusiasm. It was adorable to watch... even though I cheer for an opposing team! Ha ha. 2.) 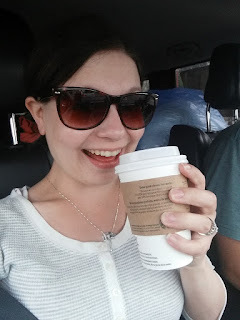 Pumpkin spice lattes are back! I love them and don't often get them as we don't have any coffee shops in our small town. I was pumped to get one this weekend. I used a gift card that I had received so I think the coffee tasted slightly better because it was free! 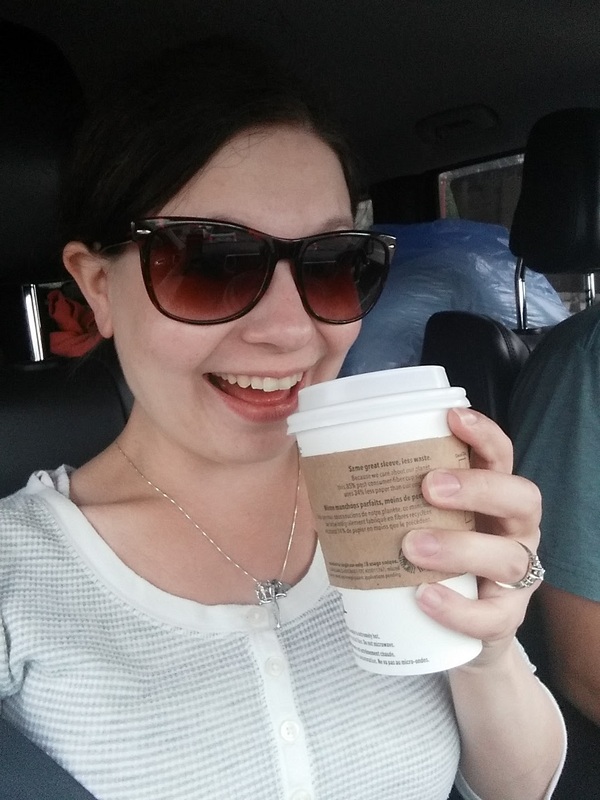 I am terrible about remembering to take pictures, but somehow captured this awkward selfie with my drink. 3.) I have been fortunate to receive so many delicious fruits and veggies from friends and family's gardens. I have my work cut out for me this weekend and I couldn't be more excited! 4.) I had 2 lovely play dates this week. I absolutely love play dates and getting to visit with my "Mom" friends. 5.) I had a really bad sinus headache that morphed into a migraine on Wednesday night. (Harvest time is rough on the allergies!) Hubby was at a course that evening so I just shoved the leftovers from supper in the fridge and headed to bed with Miss. E. When I woke up, Hubby had cleaned up the kitchen and had done all of the dishes. It was a wonderful surprise. I am really thankful to have such a wonderful husband. I am keeping all of my friends in Cuba and Florida in my prayers. Please stay safe. I hope everyone else has a lovely weekend! I don't even like Pumpkin Spice Lattes that much and I totally want to get one this weekend, haha! And that's so nice that your husband just knew to tidy up for you. Hope you're feeling better! I am feeling much better, thanks! Yup, my Hubby is a sweetheart! I've never had a migraine before, but I know how awful sinus headaches can be. It was so nice of your husband to clean up. I hope you're feeling better now! I hate the taste of pumpkin spice, but I LOVE the smell of it.lol Glad you got one, especially since it was FREE!!!! Right? That smell is divine!